For me, my bowl chili isn't complete until I crush up some Fritos on top. 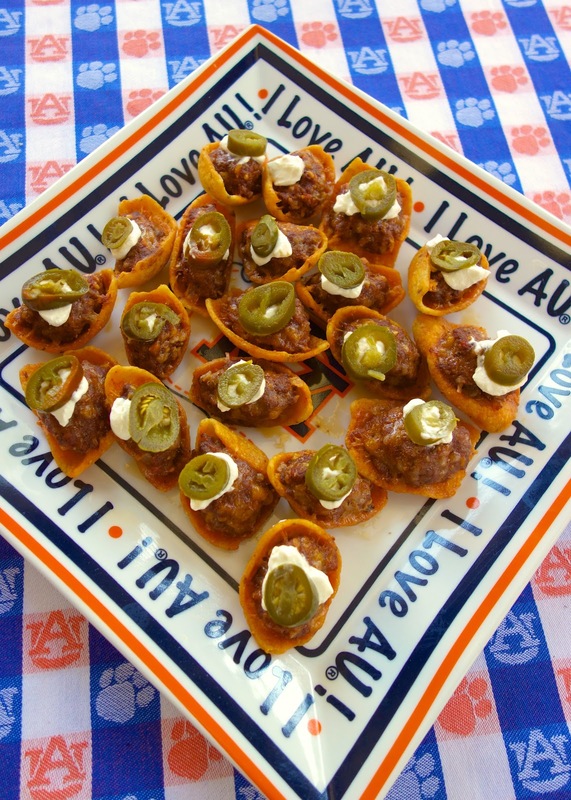 I needed a tailgating dish for the game last weekend, and I thought how about bake the chili right in Fritos - LOVE! These are really more like chili seasoned meatballs than actual chili. I didn't want any of the chili to fall out of the Fritos when I served this. 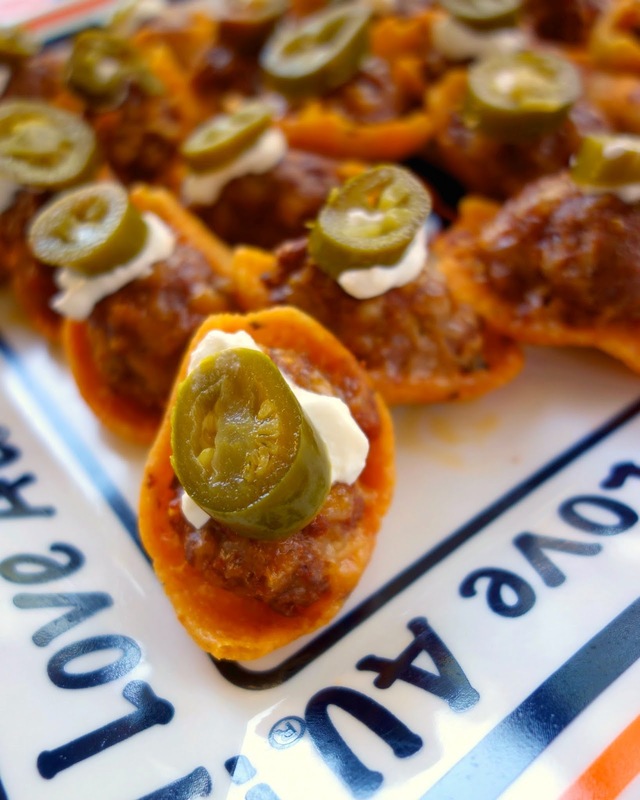 You will want to use a lean ground beef because the Fritos are pretty greasy on their own. Also, make sure you buy the Scoop Fritos and not regular Fritos. The regular Fritos are not big enough for this. You can stuff the Fritos ahead of time and keep them refrigerated until you are ready to bake and serve them. I topped our Chili Cheese Stuffed Fritos with some sour cream and a jalapeño. They were a huge hit! Combine ground beef, chili seasoning, onion, and cheese. Pick out the best unbroken Scoops Fritos. Stuff about 1 tablespoon of the meat mixture into each Frito. Place on a baking sheet and bake for 15-20 minutes. Top with sour cream and jalapeños, if desired. No, I'm not up this early. I schedule my posts to go up the night before. Now, I have been known to stay up that late reading a book. LOL! I make Frito Pie all the time....kinda sorta the same thing lol. No peppers though...I'm a big wimp and don't like spicy things. I skipped the peppers on mine too. Perfect Iron Bowl food! It might actually be chili weather by then. Now how do I transport these to the South Alabama game without them being taken from me?? I can't help you there. :) These go quick! Grind up some Ancho chillies and powder them over the top! I know this is probably a stupid question....do you brown the meat before combining? or mix all and let the beef cook during the trip to the oven....Thanks! Don't cook the meat first. It will bake in the Fritos. Enjoy!! Very creative appetizer and & looks like they would be well worth the effort. We have always done this with taco seasoning, I'll have to give the chili seasoning a try too. Love these things.